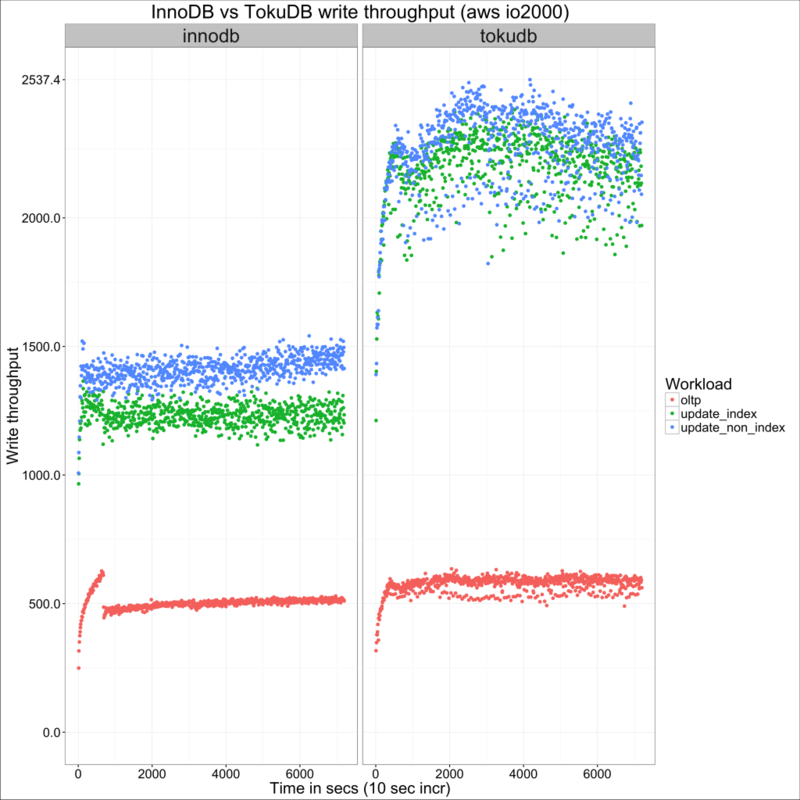 Let's take a look at the difference in performance between InnoDB and TokuDB by comparing write throughput using sysbench. In a recent post, Vadim compared the performance of Amazon Aurora and Percona Server on AWS. 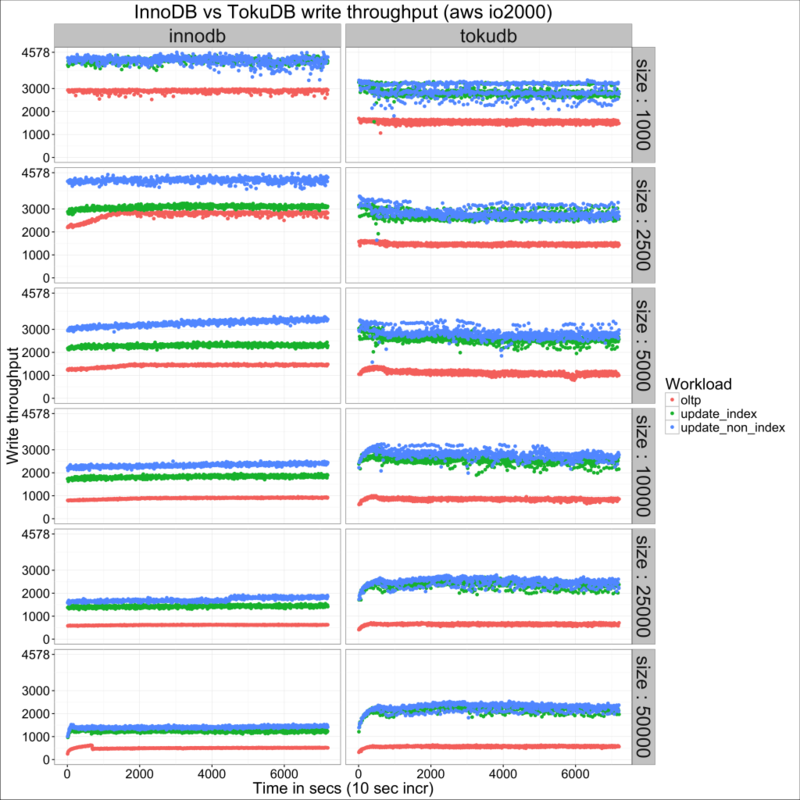 This time, I am comparing write throughput for InnoDB and TokuDB, using the same workload (sysbench oltp/update/update_non_index) and a similar set-up (r3.xlarge instance, with general purpose ssd, io2000 and io3000 volumes) to his experiments. You can see the full set of graphs here, and the complete results here. InnoDB has better throughput for smaller table sizes. The reverse is true as size becomes big enough (after 10M rows here). 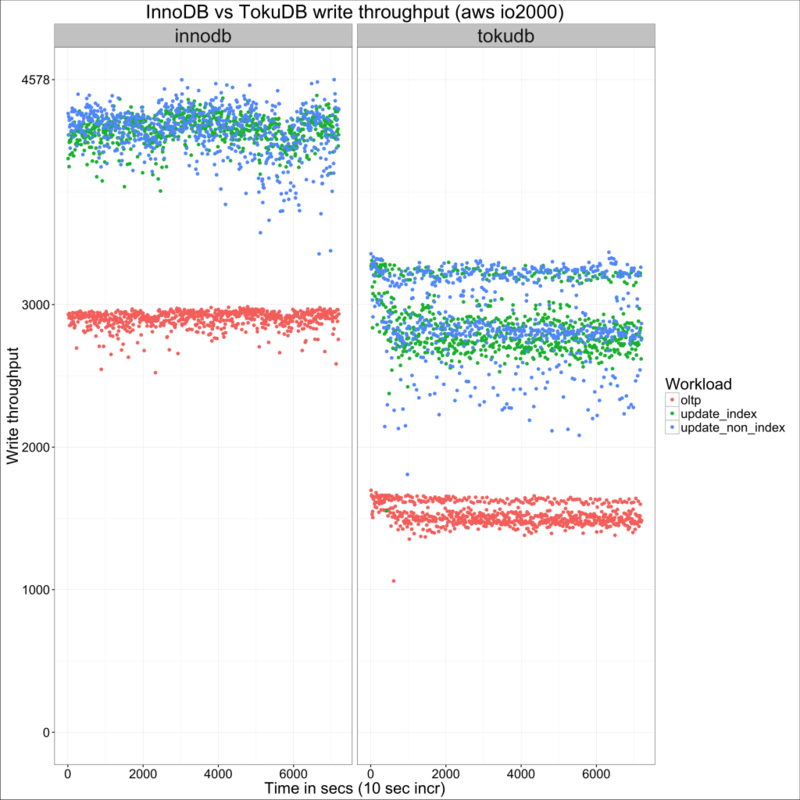 TokuDB’s advantage is not noticeable on the oltp workload, though it is for InnoDB. In the first case, we can see that not only does InnoDB show better write throughput, it also shows less variance. In the second case, we can confirm that the difference does not seem significant for oltp, but it is for the other workloads. This should come as no surprise, as one of the big differences between TokuDB’s Fractal trees and InnoDB’s B-tree implementation is the addition of message buffers to nodes, to handle writes (the other big difference, for me, is node size). 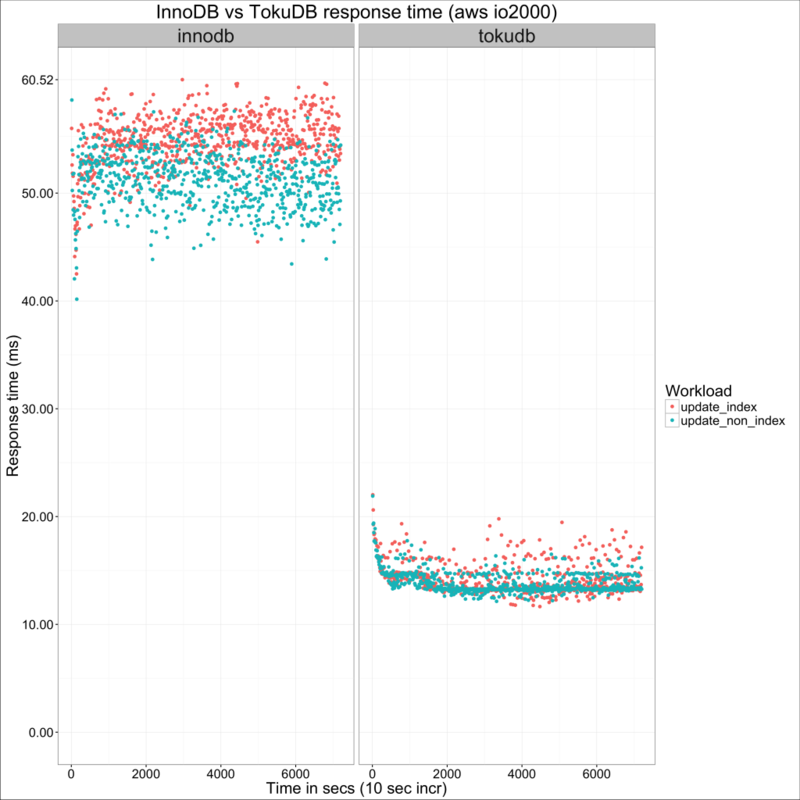 For write-intensive workloads, TokuDB needs to do a lot less tree traversing than InnoDB (in fact, this is done only to validate uniqueness constraints when required, otherwise writes are just injected into the message buffer and the buffer is flushed to lower levels of the tree asynchronously. I refer you to this post for more details). 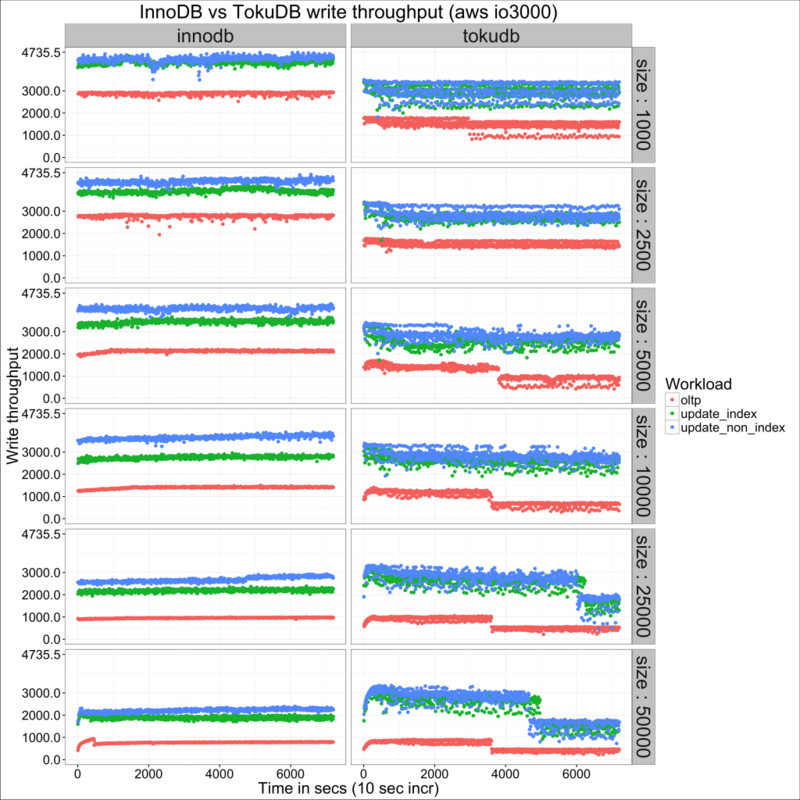 For oltp, InnoDB is at an advantage at smaller table sizes, as it does not need to scan message buffers all across the search path when reading (nothing is free in life, and this is the cost for TokuDB’s advantage for writes.) I suspect this advantage is lost for high enough table sizes because, at that point, either engine will be I/O bound anyway. I say “I attribute” because, unfortunately, I do not have any metrics other than sysbench’s output to go with (an error I will amend on future benchmarks!) I have seen the same pattern while working on production systems on AWS, and in those cases I was able to correlate it with increases in stime and/or qtime on diskstats. The fact that this is seen on the lower and higher capacity volumes for the same workload, but not the io2000 one, increases my confidence in this assumption. I would not consider TokuDB a general purpose replacement for InnoDB, by which I mean I would never blindly suggest someone to migrate from one to the other, as the performance characteristics are different enough to make this risky without a proper assessment. It has a significant advantage over InnoDB on slower devices and bigger data sets. Better compression (helped by the much larger block size).